I checked the "zoom" tool.. what a view at 2nd most zoomed level.. stars are next to eachother as if they are sand grains on a beach.. I wonder what's the smallest distance between any 2 stars in the densest region.. and, will there be darkness on any planet in one of those star's solar system ? They might be seeing multiple stars in their sky - all time. No ? Anyone can shed light (enlighten me) on my above query ? Thanks in advance! I attempted to respond yesterday but my device's battery died just moments from hitting submit. Since the rules of physics are universal star sizes, types, distribution, etc. would in general be the same over there as here in our galaxy shaileshs. Therefore the night skies on a planet like ours in the Triangulum galaxy would be much like ours. Stars only appear close together (except for close binary pairs which look like one star). Star systems are usually several or even a great number of light years apart. The stars themselves are unresolved, but the spaces between them are not. We see each point of a star as much, much larger than it actually is. That's what gives the "sand grains on a beach" appearance. In actuality, what we're seeing is a handful of sand grains sprinkled across a football field. Huge distances between the grains compared with their individual sizes. We're looking here at the central bulge of a galaxy, where the stellar density is much higher than it is in the sparse section of the Milky Way where our own solar system resides. To a first order, the density in much of this image may be 100 times greater than what we have here around us. So yes, the sky will be brighter at night. But it will still get dark... imagine a sky similar to what we see during a full Moon. Additionally shaileshs, stars can look close together when one is way in the foreground or background, when in reality they could be thousands of light years apart. Photos are 2D snapshots of 3D (well, really 4D) reality. One reason why this APOD is false colored is because of the filters used when the image was produced. If the Hubble people didn't use an Hα filter for this image, the Hα emission nebulas won't come out as red in an image like this. I checked the filters used for the picture of M33. One was a wideband blue filter, centered at 475 nm (which is blue but pretty far from ultraviolet), and one was a wideband near infrared filter centered at 814 nm, which is very far from the Hα line at about 656 nm. Ann, I don't think you quite understand this. The colors we see here don't have anything to do with the filters chosen to make the image. In this case, the image data was collected through two filters- one of them collected a broad range of visible light ranging from violet to green (400-550 nm). The other collected a broad range of near-IR light from about 700-950 nm. The result of this was a pair of images containing limited color information. Basically, a couple of B&W pictures, one with the lower half of the spectrum, one with the upper half. Last edited by Chris Peterson on Sun Feb 24, 2019 10:51 pm, edited 1 time in total. I agree with Chris shaileshs. The diffences in our answers stem from Chris talking about the bright central bulge area, while I was speaking of an area in this galaxy similar to our own out in the spiral arms. I'm not absolutely sure that the blue nebula at top right in the APOD is really NGC 604. But it is absolutely certain that the nebula in question is an emission nebula and that its dominant color is red. Yes, it is NGC 604. If you follow “the second largest image ever released” link, you’ll see a thumbnail of that blue nebula identified as NGC 604, which links to this page. I didn’t see an explanation of the color — why an H-II region is blue rather than the usual pinkish-red. It is blue because it is false colored. Groan. Why do you think you hear me complain about the color of Hubble images (and other astroimages) all the time? Emission nebulas always contain Hβ as well as Hα, although Hα dominates. None of the filters used for this image can detect Hα at 656 nm, but Hβ at 486 nm is almost smack in the middle of the wideband blue 475 nm filter. So the less dominant blue 486 nm Hβ line from the dominant red Hα emission nebulas in M33 will stick out like a sore thumb and paint all those nebulas an incredibly vibrant shade of blue. Here we can also find the explanation for the unnaturally orange color of M33. All stars emit appreciable amounts of infrared light. But many cool stars emit practically no blue light at all. A two-filter image using a blue and an infrared filter will preferentially detect the infrared light of huge numbers of cool stars. The infrared light from all these cool stars will then be shown as visual red in the image and make the galaxy appear much more orange than, say, a comparison with the color of the Sun would make it appear. this image is not falsely colored. it is simply translated into colors your eyes can see. Last edited by geckzilla on Sun Feb 24, 2019 5:35 pm, edited 1 time in total. I am just super duper annoyed at the constant "this isn't right because it's not how human eyes see it or how [favorite astrophotographer] makes image"
Almost everything interesting happens outside of the narrow band of wavelengths the human eye is sensitive to. It's so fundamental and so important to get out of the tiny cage that human perception puts us in. You edited your post? You no longer agree that the filters used for this APOD don't detect Hα? You are saying that the filters may indeed have detected Hα, but the Hα was shown as blue, for unspecified reasons? And, hey. I do realize that there is a world of wavelengths outside of what the human eye can see, and I do understand that a wealth of information can be gained from detecting those non-visual wavelengths. And I do realize that non-visual wavelengths have to be shown in mapped color for us to see pictures of them in the first place. I'm just saying that a wideband blue filter centered at 475 nm does detect light that the human eye can see. And... okay, I'll shut up now. I edited it because I was explaining something you already understood, but I didn't catch it in my first read through of your post. H-alpha is not being shown at all, which is correct. The F475W filter overlaps with [O III] emission, which is part of the reason it was used. So most of the emission we're seeing here is probably from [O III]. And I *know* you realize this, which is why it bothers me so much that you're always grinding your ax against anything that doesn't meet your particular standards of beauty. Just for fun, here's the same image presented with two different color mappings, one which assigns red to the IR data (the original) and one which assigns blue to the IR data. (Both split green between the IR and visible.) Is one "better" than the other? I wouldn't say so. If you ask me, it would pretty horrible to assign blue to the IR channel (and red to the blue channel?). Talk about doing one's very best to "disrespect true color"! In any case, I have written to Hubblesite and asked them several questions about their picture of M33. If they answer, I will share their answers here. That makes no sense to me. There is no "true color" present in the source data. Any image which is mapped in such a way that it might be confused as such is arguably poor. The mapping is about presenting data, much of it outside our visual range, in a way that enables our brains to extract useful information. It isn't about "true color". It isn't about aesthetics. Perhaps a better choice would be to map the IR to green, the visible to blue, and to split the two in the red channel. The important information still seems to be evident, but there's no risk of falling into any "true color" interpretation trap. I see your point, Chris. I do. But I don't think that the Hubble people will take your advice. Imagine them showing a galaxy picture where the IR channel has been mapped to green - maybe, say, an iconic galaxy like M51? There is a logic to mapping the longest wavelength data channels to the longest wavelength output channels. But that does produce fairly natural looking colors (even though they are in no way accurate, nor intended to be) and therefore risks confusing people about what these objects actually look like. And what they actually look like is generally not on the list of science objectives at all. Here's one more way of looking at the data, which is perhaps the most accurate of all. Eliminate the color mapping, and move the two channels into the time domain, alternating the IR and the visible. Last edited by Chris Peterson on Mon Feb 25, 2019 2:54 pm, edited 1 time in total. I know. My own interest in astronomy is both about aesthetics and science. I think that astronomy at its best is stunningly beautiful as well as fantastically intriguing and "revealing". Science that contains no "color" or even "pictures", like mathematics, physics and chemistry, does not appeal to me, unfortunately. That seems quite tragic to me. Science is about knowledge, about understanding nature. That's its beauty. To appreciate the output of science when it produces something visually aesthetic is perfectly understandable (and is the reason that we have aesthetic imaging contests within different scientific disciplines). But to lack interest in important areas of science, of fundamental understanding, simply because they produce no color or imagery? That's just sad. You misunderstand me, because I didn't choose my words correctly. I'm not uninterested in maths, physics and chemistry, as such. But when it comes to astronomy, I will eagerly read what astronomers have concluded, and why. And I will try to picture their methods in my mind. But when it comes to maths, physics and chemistry, the sort of science that can only be expressed in scientific formulas, my mind "dries up". Yes, I am interested in what those branches of science have concluded about the world and the universe that we live in. 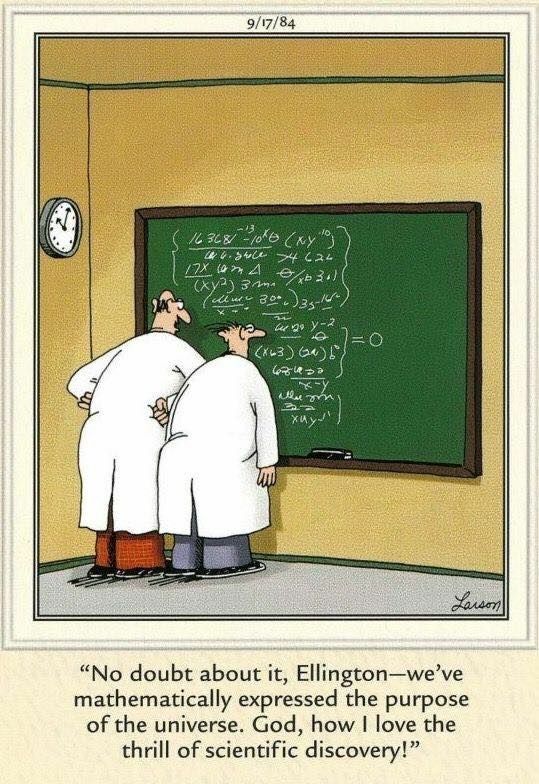 In particular, particle physics has a lot to do with our universe, so I try to understand a very, very little of it. But when I see mathematical formulas like these, I give up. I'll happily listen to what mathematicians can tell me about their formulas and what they mean, but I have not the slightest desire to sort of "dig in" and actually try to follow this sort of mathematical reasoning myself. Ripened bananas (left) fluoresce in blue when exposed to UV light. <<Export bananas are picked green, and ripen in special rooms upon arrival in the destination country. These rooms are air-tight and filled with ethylene gas to induce ripening. The vivid yellow color consumers normally associate with supermarket bananas is, in fact, caused by the artificial ripening process. I'm not sure where the myth that monkeys eat bananas started — I personally suspect Curious George— but it's time for it to stop. Wild monkeys don't eat them. "The entire wild monkey-banana connection in fact is total fabrication," Katharine Milton, who has studied the diets of primates for decades, told Tech Insider. "The edible banana is a cultivated domesticated plant and fruit. Wild monkeys never encounter bananas at all ever unless they are around human habitation where bananas are or have been planted." I'm not uninterested in maths, physics and chemistry, as such. But when it comes to astronomy, I will eagerly read what astronomers have concluded, and why. And I will try to picture their methods in my mind. But when it comes to maths, physics and chemistry, the sort of science that can only be expressed in scientific formulas, my mind "dries up". Yes, I am interested in what those branches of science have concluded about the world and the universe that we live in. In particular, particle physics has a lot to do with our universe, so I try to understand a very, very little of it. 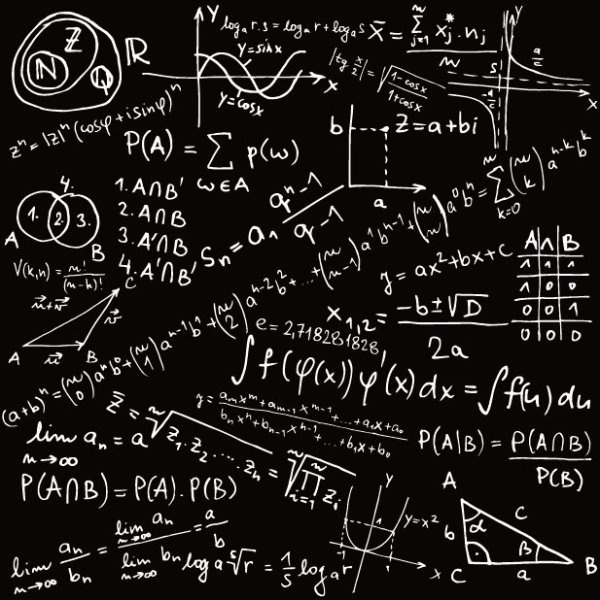 But when I see mathematical formulas like these, I give up. I'll happily listen to what mathematicians can tell me about their formulas and what they mean, but I have not the slightest desire to sort of "dig in" and actually try to follow this sort of mathematical reasoning myself. This wandering discussion about colors and color mapping, and what people like in science is partly my fault, having kicked it off by totally misinterpreting the color of NGC 604 in an image. I appreciate Ann's efforts to help me sort it out. It can be very confusing, looking at an APOD and trying to guess what you really should or should not conclude from the imagery. Thanks, Chris! Absolutely fascinating! I somehow missed this post before. Note how extremely different M33 looks in blue and infrared light. In infrared light, it looks almost amorphous, but in blue light it becomes much more spiral-like with sharp dust lanes, clusters and extended regions of young stars (think M24). NGC 604 in X-rays and visible light. Perhaps the most fascinating detail is how NGC 604, the huge emission nebula in M33, appears in the two images. It is quite large and striking in the blue-filter image. What has been detected by the blue filter is OIII emission, as Geck pointed out before. But NGC 604 is indeed detected by the infrared filter, too. However, it looks small and faint there. I find it most unlikely that the infrared filter has detected Hα. Instead, it must have detected dust. 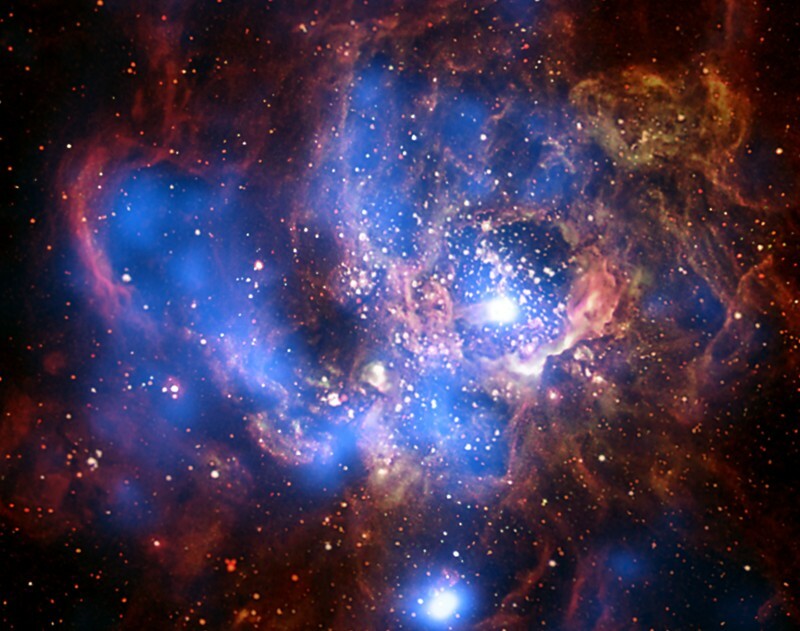 Take a look at the picture of NGC 604 at right. The diffuse blue light is X-rays that have been mapped as blue. (The X-rays would not have been detected by either of the filters used for the Hubble image of M33.) The red and yellowish details in the picture at right is much cooler gas, but almost certainly also dust. This dust must have been warmed by the onslaught of energetic particles from the hot stars in NGC 604, and the warm dust is what the infrared filter must have detected. The IR band here is barely out of the visible. It doesn't show cool dust, but rather, part of the direct output of stars. At that longer wavelength, however, dust is somewhat more transparent, so we see deeper into dusty regions. In the near IR, dust is less apparent than in the visible range (but in both cases it is absorbing light, not emitting it). So, hydrogen for sure, maybe [S III] too. With that data you could toss the F160W and map the others to RGB and get something approaching a true color image (not perfect, but reasonable).